Zinc Picolinate 22mg 60 caps. The preparation is recommended to be used every day especially by people belonging to the risk group of zinc deficit. 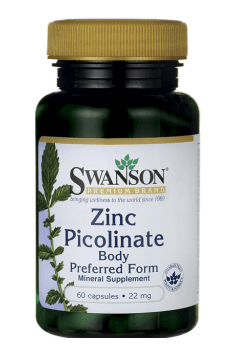 According to the data from the scientific studies, taking zinc at the dose of 15-30 mg a day may serve not only as therapeutic element supplementing deficits, but also for prophylactic purposes. It is best to take zinc 1-2 hours after a meal, as unfortunately there are many food-related factors that may inhibit its absorption. Moreover, in case of long-lasting application of the preparations with zinc, it is worth adding a supplement with copper, as zinc contributes to its increased elimination. The best dose of copper is 1mg per each 10 mg of zinc.